Stage one of the colossal 12-bar, three-stage, two-restaurant redevelopment opens to the public today. Take a look at the all-new grandeur of this legendary seaside pub. To revamp and relaunch the Hotel Esplanade was never going to be easy. 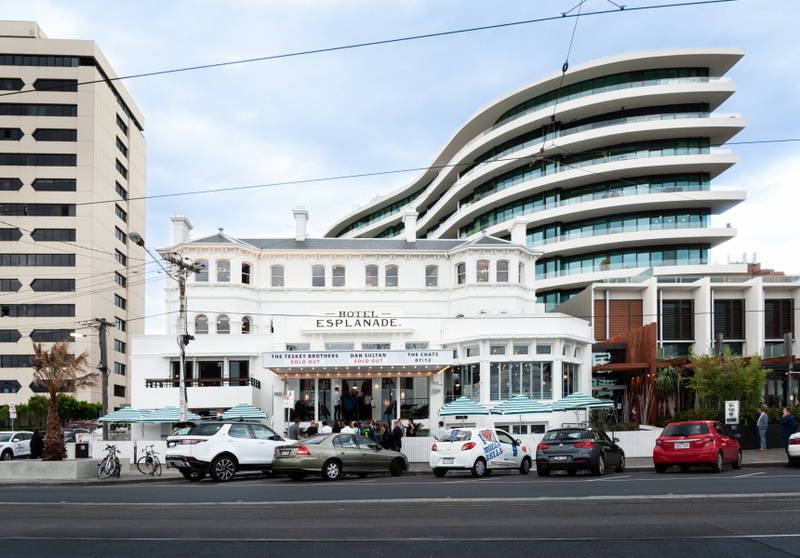 Since 1878 the grand seaside hotel has been a centrepiece of St Kilda, and the team from Sand Hill Road (Waterside Hotel, Garden State, Prahran Hotel among others), which bought the local stalwart in May last year, has thrown everything it has at it. 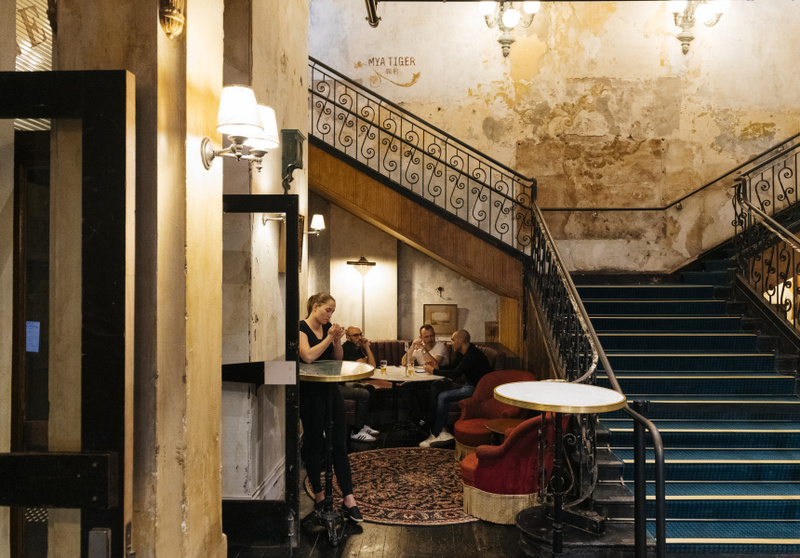 The Espy redevelopment is immense and it had a lot of potential to be a disaster – if not for the cost of inputting 12 bars, three stages and two restaurants across six levels (formerly three) of a 140-year-old building, then for what it represents to many Melburnians. Mess with it at your peril. 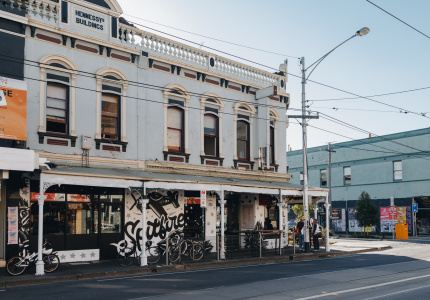 Sand Hill hasn’t taken that responsibility lightly, again teaming up with architecture firm Technē (the companies have worked together on more than 20 projects over the past decade, including Garden State, The Bridge Hotel and the Prahran Hotel). Those familiar with the Technē’s work will know the resulting venues can be a maze of hidden secrets. You can hit up Garden State a dozen times and not realise there’s a restaurant out back and a cocktail bar downstairs. 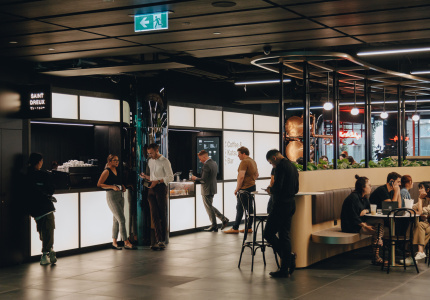 The new Espy has a stronger flow than its stablemates, in part thanks to a concierge desk installed near the entrance. Sand Hill co-founder Doug Maskiell says it’s an example of learning from past builds. Standing in the light-filled atrium will be familiar to those who spent time at the old Espy, though the space has been revitalised. Through the retractable glass ceiling, you can look up at the upper levels of the building, while large front-facing windows offer views of St Kilda and Port Phillip Bay as trams ding their way past. You can brunch here on the weekends (crab omelettes, green nourish bowls), then sip cocktails and tap beer until the sun sets (and well after). “What we really wanted to achieve, as you walk in, [is that] you feel you’re outdoors and feel you’re part of the ocean and the bay,” Maskiell says. Once you take your eyes off the view, part of the continuing charm is the interiors all look so worn and lived in. The large wall at the back of the main staircase is faded and peeling. Some sections of the ceiling are the 140-year-old original and others are brand new, but you won’t see the difference. 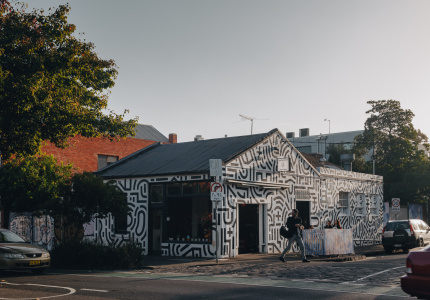 It’s the work of painter Meg Milton, who specialises in making the new look old. She’ll leave you wondering if the chipped paint and water stains are the result of age and wear, or just clever design. 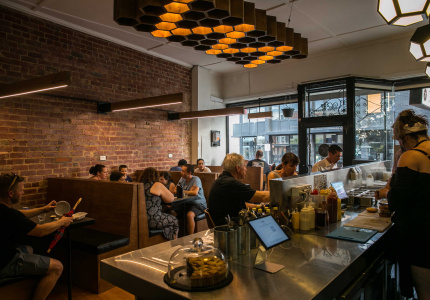 It goes without saying live music is a key part of the Espy, and a redevelopment that didn’t embrace it would’ve been devastating. Thankfully there are three spots dedicated to it here. 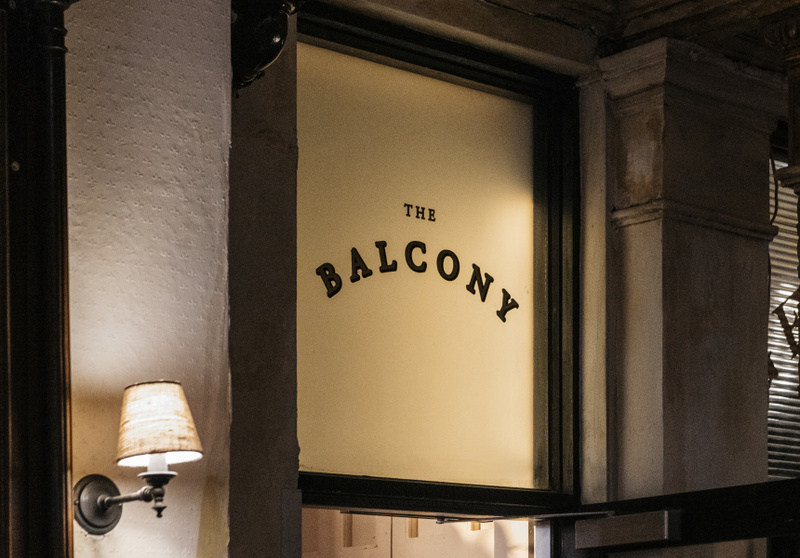 At the base of the grand staircase, a round stage will host small bands and DJs, and a basement bar downstairs will be home to emerging and local acts. The Gershwin Room is the music heart of the Espy and remains relatively unchanged – aside from a good clean and a brand-new sound system – and those of you who’ve spent hot sweaty nights on the dancefloor will be pleased to hear it is now air-conditioned, too. Acts such as Dan Sultan, the Chats (remember that Smoko song?) and Tex Perkins are already booked to play. In an embrace of the podcast medium, there’s a ’70s-inspired bar specifically for creators to record their own. Fans can plug in and listen from spots at the bar, and if no one is recording at the time, there are four channels playing pre-recorded podcasts, as well as band recordings from the Gershwin Room. If it’s all a bit overwhelming, head down into the easygoing Public Bar at the bottom corner of the building. “Wear whatever you like, I don’t care if you’re just off the beach,” Maskiell says. “Put a smile on your face and go for a drink.” A path of old Espy gig posters (thousands of which were found rolled up in storage during renovations) leads down to the Basement Bar. The Espy may be huge (and this is just the beginning – the upper levels aren’t open yet) but the Sand Hill Road team is at pains to prove the new iteration isn’t all about concierges and cocktails. No place in the complex says that better than this subterranean band room. The old loading bay and car park at the back of the building is now the Espy Kitchen. With executive chef Ash Hicks (now-closed Circa, Garden State) in charge, it’s an open-kitchen affair. 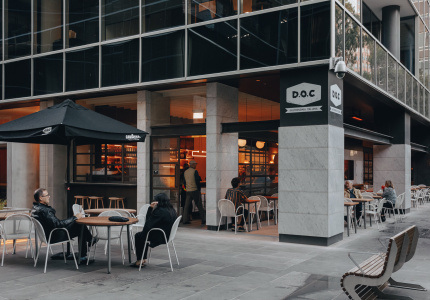 You can watch chefs work the two woodfired pizza ovens, or the rotisserie and woodfired grills, or grab a seat by the voyeuristic glass-walled corridor and watch bands walk from green room to stage. 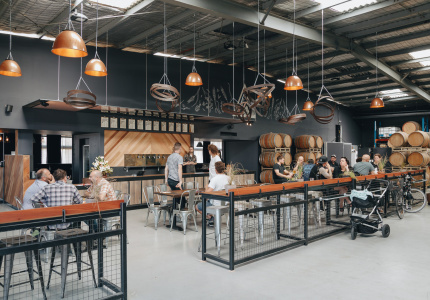 The walls are lined with new and old oak barrels, used for a bespoke barrel-ageing program featuring spirits, cocktails and even beer, with Mountain Goat and Stomping Ground both involved. On the menu, Moreton Bay bug rolls; beef tartare with black bean and potato crisps; and barbeque octopus with green chilli and tomato, or prawns with garlic butter. More substantial is the whole rotisserie chicken with fries and gravy, or the baby snapper with fingerlime and parsley. 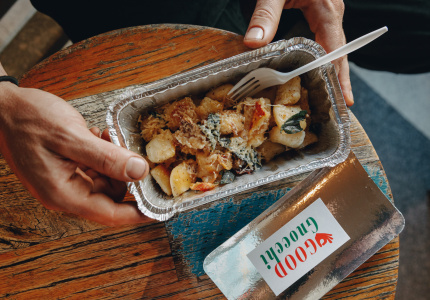 Pizzas come topped with San Marzano tomatoes, ‘nduja, buffalo mozzarella, pecorino and fresh basil; or confit garlic, mozzarella, scamorza, black pepper and parmesan. 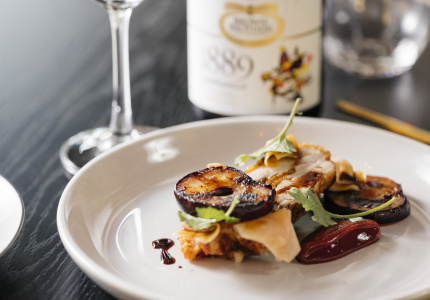 Vino-wise, well-known sommelier and wine writer Matt Skinner is handling the list across the board. 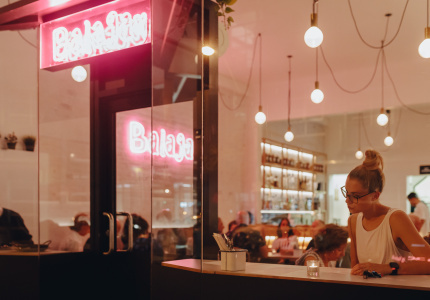 He’s kept it wallet friendly – you can get a glass of bubbles for under $10 and no bottles in any of the bars cost more than $100. The lists offer a solid mix of accessible and gently challenging, mostly local drops with a few European cameos. Cocktails are designed with sunny St Kilda afternoons in mind. The Seaside Spritz is strawberry, Aperol, watermelon, soda and sparkling wine; and the Shaky Pete is being touted as a hangover cure, a frozen concoction of Four Pillars gin, honey and ginger topped with Balter XPA. There’s also Espresso Martini, Aperol spritz and Pimm’s cup on tap. 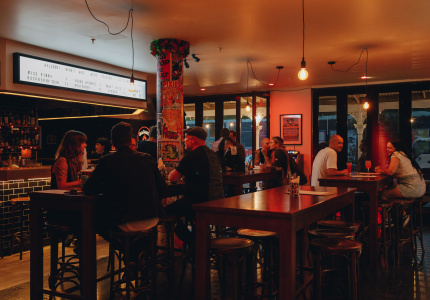 A lengthy list of local craft beers sits alongside Corona, Carlton Draught and Asahi. Gigs kick off in the Gershwin Room this week, and more lower-level spaces will open on November 27. The upper levels of the venue, including Cantonese restaurant and cocktail bar Mya Tiger, will launch in the first week of December.